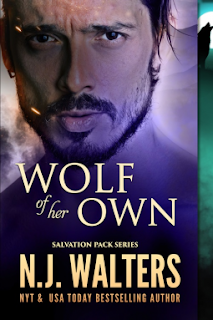 Mikhail might have come to the Salvation pack for his sister but as soon as he finds Elise, he knows he can't leave. Elise has a lot of baggage because of the years she spent with her abusive ex. She might be cautious when Mikhail is around but she feels something for him and that in itself is a small miracle since she wasn't sure she was healed enough emotionally to take another chance on a relationship. Mikhail is very patient with Elise and I really liked that about him. He's pretty sure that Elise is his mate but he knows he's gonna have to take his time with her and her family if this is gonna work out. Neither of them are sure how her two sons are going to react to them seeing each other especially since one of her sons is the pack's alpha. I ended up really liking her sons. When the father of one of the females in the pack wants to come and visit his daughter that he hasn't seen in a long time, they are all on edge but what happens while he is there is not something that any of them could see coming. Elise is stronger than she thinks and I really admired her for being able to move past what she's been through and find happiness again. But Mikhail is everything that any woman could ask for. He's patient, romantic, totally alpha and nurturing. He's exactly what she needed in her life. I really liked Elise's grown sons even if they were a little over protective, they meant well and love their mom a lot. This is one of those books that I wish I could just say something like, "It's great! You need to read it!" And everyone would read it and see what I mean. I read this book in one sitting because it was just that hard to put down once I started reading. I felt invested in the characters to see what would happen next and I was very happy with the ending. It ended exactly how it should have. I'll definitely be reading more of this series and highly recommend this book and series.